Like much of Palm Beach County, the land thatâs now Old Palm Golf Club was once owned by the late insurance magnate and philanthropist John D. MacArthur. At the time of his death in January 1978, MacArthur was one of the three wealthiest men in America. His wife, Catherine, kept the company books and was intimately involved in her husbandâs businesses. Together, they founded the John D. and Catherine T. MacArthur Foundation, an institution dedicated to âbuilding a more just, verdant and peaceful world.â The foundation eventually sold thousands of acres to developers in Palm Beach Gardens and to the city itself. Old Palm rests on the last large parcel of land, which had always been kept in a pristine state, as MacArthur was passionate about preserving the natural beauty of Florida. He surely would have loved Old Palm Golf Club, which has earned the Audubon Societyâs Gold Signature Sanctuary certification in recognition of our stewardship of the land. 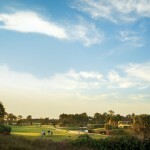 Native landscaping and a reverence for nature are all part of Old Palmâs attraction for those who enjoy the areaâs natural beauty much like MacArthur did.